[223 Pages Report] The Security Labels Market was valued at USD 20.61 Billion in 2015 and is projected to reach USD 26.47 Billion by 2020, at a CAGR of 5.13% from 2015 to 2020. On the basis of compositon, facestock accounted for the largest market share among all compositions for security labels. Bar codes accounted for the largest share in terms of both volume and value. In 2014, the application segment was dominated by the food & beverage sector followed by retail and consumer durables. Security labels in the form of sheets accounted for the largest share in terms of both volume and value. The final segment, that is, the region, consists of North America, Europe, Asia-Pacific, and the Rest of the World (RoW). Globally, competition in the security labels market is growing considerably owing to the improvement in labeling technologies such as bar codes and radio-frequency identification. Security labels convertors are keen on developing innovative labeling solutions that can withstand severe weather conditions such as extreme temperature and abrasion. The base year considered for the sudy is 2014 and the market size is forecasted from 2015 to 2020. The research methodology used to estimate and forecast the market size included the top-down and bottom-up approach. The total market size of the security labels was calculated, and accordingly, the percentage was allotted to different sectors in each of the segments. The allotment and calculation were done on the basis of extensive primary interviews and secondary research. Primary research involved in this report includes extensive interviews with key people such as CEOs, VPs, directors, and executives. After arriving at the overall market size, the total market was split into several segments and subsegments. These data triangulation and market breakdown procedures were employed to complete the overall market engineering process and arrive at the exact statistics for all segments and subsegments. The breakdown of profiles of primary respondents is depicted in the figure below. The security labels ecosystem comprises companies such as 3M Company (U.S.), Avery Dennison Corporation (U.S.), CCL Industries Inc. (Canada), UPM (Finland), and Honeywell International Inc. (U.S.). The other players in the market are Tesa SE Group (Germany), Seiko Holdings Corporation (Japan), Group Dc (Canada), Label Lock (U.K.), and Polylabel.com (Canada). These provide solutions to end users to cater to their unique business requirements and needs. This report estimates the size of the security labels market in terms of volume (million square meter) and value (USD million). In this report, the market has been segmented broadly on the basis of type, form, identification method, composition, application, and region. The market drivers, restraints, opportunities, and challenges, and product price trends have been discussed in detail. The share of participants in the overall market has also been discussed, in detail. This research report categorizes the security labels market based on type, form, identification method, composition, application, and region. 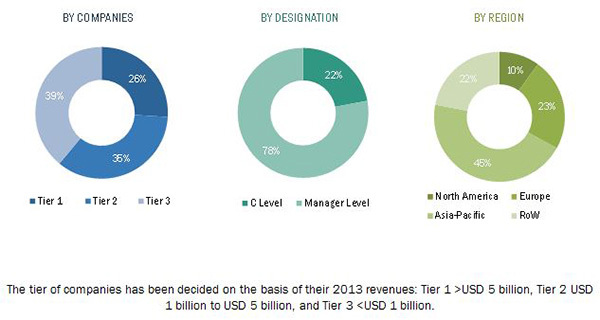 MarketsandMarkets projects that the security labels market size by value will grow and reach USD 26.47 Billion by 2020 at a CAGR of 5.13% between 2015 and 2020. The market is growing in accordance with the growth trends of the converting and labeling industries. Factors such as increasing demand from food and beverage industry, demand for retail supplies, consumer durables, and logistics application, increasing consumer awareness, and growth of the e-commerce industry have propelled the growth of the global security labels market. Security labels are used for anticounterfeiting, brand protection, transmitting information, and providing waring, among other functions. Product innovations and technological developments in the market are expected to create strong investment opportunities. The security labels market is segmented on the basis of type, form, identification method, composition, application, and region. On the basis of composition, facestock held the largest market share, in terms of both volume and value. Bar codes was the most widely used identification method among other technologies, in terms of both volume and value. On the basis of form, sheets held the largest market share, in terms of both volume and value. On the basis of application, the market is segmented into food & beverage, retail, consumer durables, pharmaceuticals, and others. 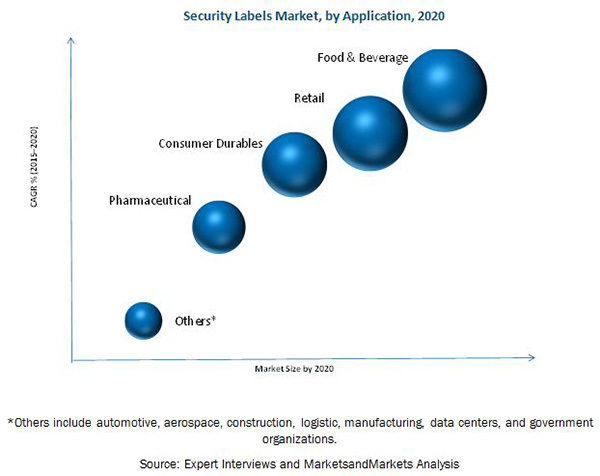 Increasing disposable incomes of people in developing countries and changing preferences of manufacturers for cost-efficient and effective labeling are some of the factors that are driving the security labels market. On the basis of key regions, the market for security labels is segmented into North America, Europe, Asia-Pacific, and the Rest of the World (RoW). The European region held the largest share among all the regions in 2014. This is mainly due to emerging economies in Germany and U.K., coupled with growing applications of security labels in the food & beverage and consumer durables industry. Asia-Pacific is projected to be the fastest-growing market during the forecast period, due to the growing demand for security labels products and increasing awareness among end users. In terms of type, branding is projected to be the largest market for security labels. Certain factors such as the high capital investment, lack of standards & regulations, rising environmental concerns, and rising raw material cost hinder the growth of this industry The rising raw material cost is one of the strongest restraints for the security labels market. High raw material costs are at the forefront of the agenda of both end-user packaging buyers and their label-converter suppliers. Raw materials such as film materials, resins, inks, paper & wood pulp, hydrocarbon resins, carbon black, adhesives, and solvents are largely driven by rise in prices. The rise in raw material cost has added to limiting the growth of the security labels market. The new product developmets and aqusitions were the major strategies adopted by most players in this market. Companies such as 3M Company (U.S.), Avery Dennison Corporation (U.S.), CCL Industries Inc. (Canada), UPM (Finland), Honeywell International Inc. (U.S.), Tesa SE Group (Germany), and Seiko Holdings Corporation (Japan) were the key players who adopted these strategies to increase the customer base in key markets. The leading security labels manufacturers are focusing on emerging countries that are estimated to show potential for industrial development in the near future. Figure 48 SWOT Analysis: Honeywell International Inc.